After my recent disappointment with a (now discontinued) Bath & Body Works gradual tanner, I was hesitant to try another. 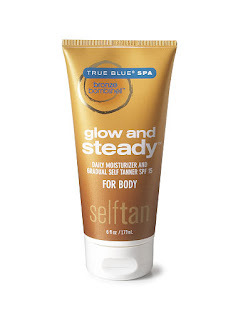 But reader LMM recommended Glow and Steady from the True Blue Spa line, so off I went to my local Bath & Body Works. I'll tell you right off the bat: Glow and Steady earns immediate HG status because it packs a secret weapon ingredient that's not often found in self-tanners...SPF 15. The lack of self tanners with SPF has been a pet peeve of mine for quite some time, so I'm really happy to have found one that's widely available. You can slather it on in the morning, hang out at the beach, and be "tan" by dinnertime, just like a real tan. Smart! Oh, and the sunscreen is part-avobenzone, so you're getting protection from both UVA and UVB rays. In my experience, avobenzone sunscreens tend to be less thick, opaque and gooey than their titanium dioxide or zinc oxide counterparts -- and this lotion's no different. It feels great on the skin and does a nice job as a body lotion. Glow and Steady also smells amazing. Remember that Victoria's Secret Bare Bronze gradual tanner that I loved? This one has the same coconutty, tropical scent, but it isn't as strong as the VS. And, it's one of the rare scents that "plays nice" with DHA, so you won't feel the urge to scrub it off once the DHA starts kicking in. I saw some color after one application, which is good, since my patience with gradual tanners has worn thin of late. After 3 applications I had a pretty nice glow going on. It could have been darker, and I wish it came in Fair, Medium and Dark varieties instead of just one, but hey, I won't nitpick too much -- the scent and the SPF already have me sold. Highly recommended!